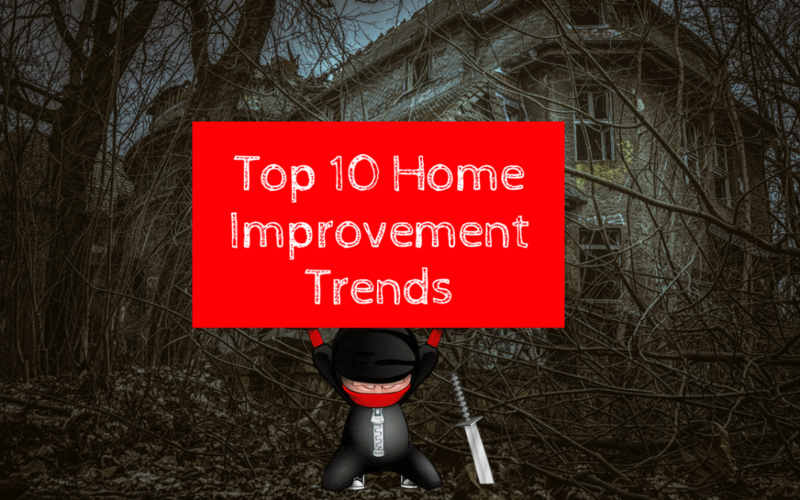 Here are the top 10 Home Improvement trends of 2018, adding just one of them to your home could significantly increase its value. Banks love that! Accommodation for multiple generations (Granny Flats or Queenslander conversions) are becoming evermore popular as the cost for aged care skyrockets, many of us are opening our homes to our parents or grandparents. The explosion of the Granny Flats, Queenslander conversions or amenity makeovers have allowed additional spaces to be turned into self-contained units that give the elderly privacy and independence. And let’s be honest, free babysitting is a plus right! This trend of widening doorways and halls is also applied by the elderly and big families who require additional space to move around safely at home, especially with walking aides. Such renovations will require a budget ranging from $2,488 to $5,587, depending on the specifications required. While that sounds a lot for a hall it’s a lot cheaper than a nursing home. These systems are supposed to be one of the biggest home improvement trends as they save energy, cut costs and can easily be customised to suit the lighting needs any time of the day or year. If you’re looking for a Gold Coast company you can trust and are experts in this type of cost savings initiative, why not contact our mates at WATMAR Electrical. Originally this was popular in apartment buildings, however, residential homes have now taken on the trend of creating exotic spaces which extend from their bedrooms. These spaces are normally fitted out with patio furniture, shade and even roof-top gardens. I can just imagine the cocktails out there already. This trend keeps gaining momentum, the in-home office is the new must-have in any home renovation or new home build. As many of us look for more flexible work arrangement, go it alone or as corporates look to cut costs, the in-home or at-home office is a highly sought-after addition to a home. According to DOMAIN, a home office could add $50-$70K to your home valuation. The old becomes the new as this home improvement trend encourages innovative ways to use old items creatively. For instance, using an old car tyre to make a coffee table or baby milk tins for storage of craft items. Why not try using old rustic wood to get a new look to the old table you have. What’s more? This may be the most affordable home improvement trend as you are reusing what you already have! So many options, not enough weekend time. Usage of more energy-efficient appliances and materials such as solar panels and solar reflective asphalt roofing shingles which are energy efficient and exemplary insulators. There will also be focus on energy-efficient windows, doors and siding. Shades of green will also come in to play to get the all-natural look. Home renovators will also be looking into doing away with the traditional white tiles, walls and cupboards and opting instead for deep dark colours such as black, indigo and dark brown. It is suggested that tapware and fixtures in brushed gold or silver would also complete the new look which boasts of sophistication and sleekness. Very much the style we saw on the BLOCK last year, check out some of their pics here. Goodbye Hamptons style, say hello to the modern barn. Snippets of the modern farmhouse trend are also returning especially with the trough and bucket sinks. They have gained popularity due to their rustic look, durability, minimal use of space and ease of use, especially with kids. This is the best solution for business people who need simplistic yet stylish storage facilities and fixtures that enable them to change or pack on the go. The storage options are endless and can be customised to suit individual needs, whether they need their shoes, ties, suits, belts, stationery and gadgets organised in clear view and easily accessible. Thinking of buying a new home or renovating your existing home? Do you need some extra funds to get your home improvement projects rolling to build / buy the house of your dreams? Thinking of refinancing your loan for improvements or debt consolidation? Whatever you decide, Blackbox Finance can help you fund it. And once you buy that new home or renovate/refinance your existing one we can even help you get a Car Loan as that old bomb will look terrible in the driveway of your new home. First World Problems that we can fix.